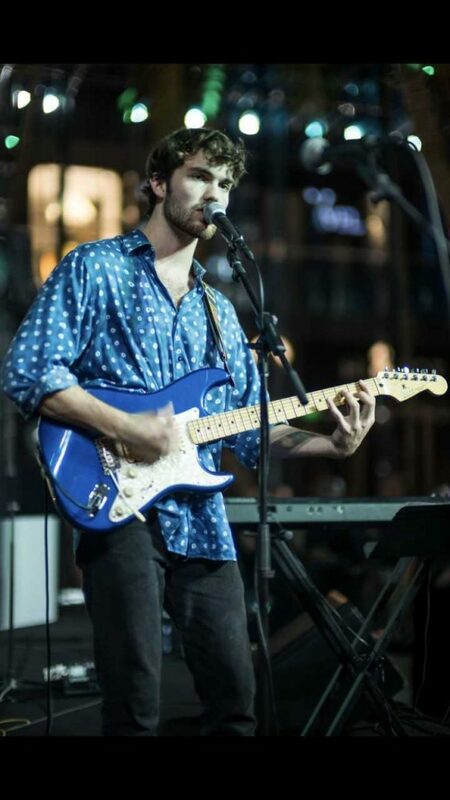 Ben Youngblood, a senior media writing and production major at Frost School of Music, can’t remember a time when he wasn’t interested in music. As a kid, Youngblood was surrounded by music, specifically his parents’ vinyl classic rock records. Initially, Youngblood was captivated by Jimi Hendrix, Eric Clapton, Led Zeppelin, the Allman Brothers and the Rolling Stones. So when his best friend at the time started playing these bands on his electric guitar, he was hooked. At only 9 years old, he began practicing on a blue Squier Stratocaster electric guitar, and within a few months, he had learned every song on the beginner’s CD. Because he had made such astounding progress in such a short amount of time, his parents finally agreed to give him lessons. They took him to his local music store, Harry’s Guitar Shop in Raleigh, North Carolina, and he began taking lessons with Ken Demery, who continued to teach him for the next 9 years. Youngblood said aside from being a wonderful mentor, Demery has become one of his best friends. In middle school, Youngblood traded classic rock for pop rock and began listening to bands such as the Killers, the Kooks and the All-American Rejects. Fall Out Boy’s “Infinity on High” was a landmark album in his musical journey; he still listens to that CD in his car now. Youngblood has been performing covers of songs ever since he started playing the guitar. “There’s no better way to gain an understanding of music and your instrument than to learn and perform well-crafted songs by other artists,” Youngblood said. He started writing his own songs in high school and performed them with his first band, Milhouse. Now, he prides himself on being a versatile musician. Each of the songs takes him back to a specific time and place in the past few years, he said. He is recording this album with local engineer and producer Andres Daza at Daza’s home studio. The album features fellow University of Miami Frost students Chris Schreck on drums, Reed Gaines on bass, Andre Bernier on organ and Youngblood on acoustic guitar, electric guitar, harmonica and lead vocals. Youngblood anticipates finishing the recording process this summer and said he hopes to release the album by August or September. He said his favorite part about playing the guitar and performing is “feeling a real connection to the music” and getting lost in the world of the song. Last summer, Youngblood was a semi-finalist in the Wilson Center Guitar Competition in Brookfield, Wisconsin. Reflecting on the competition, he said it was a great learning experience because it made him focus on his technique. However, he said he ultimately didn’t enjoy “making the art of playing guitar into a competition” and strives to “find a more creative voice on the guitar” instead of nailing perfect technique. After graduation, Youngblood said he hopes to promote his album by scheduling shows across the United States, starting in his home state of North Carolina. You can follow Youngblood on YouTube and Instagram for more updates.